For most collegiate student-athletes who participate in NCAA Division III sports and the Upper Midwest Athletic Conference (UMAC), playing at this level is an intentional choice based on multiple variables including an immense amount of opportunities to not only compete athletically at a high level but also to make the most of academic and co-curricular experiences. This was no different for Erin Gilligan who grew up playing sports at a young age in Oconto Falls, Wisconsin, near Green Bay. For her, she made a careful choice to attend Northland College for the opportunity to participate in sports—three to be exact—and the unmatched academic experience that would prepare her for an uncommon career path you won’t find at most institutions of higher learning. With just one semester to go at Northland before graduation, Gilligan—who has a double major in biology and natural resources with an emphasis in fisheries and wildlife and a minor in chemistry—has taken full advantage of every opportunity she’s had at the institution tucked away in Ashland, Wisconsin, to develop into leader who is prepared to make a difference in the environment and the world. “Northland has given me opportunities no other college can offer,” said Gilligan who has participated in basketball, golf and softball at one point during her three-and-a-half years at Northland. Application of classroom concepts and hands-on experiential learning has defined Gilligan’s college experience—during her time she’s participated in three distinctly different internship experiences that have each prepared her for a career in fisheries management. Following the completion of her first academic year, Gilligan took an internship with the education department at the NEW Zoo in Green Bay where she educated the public about conservation efforts being done with several species at the zoo and presented animals such armadillo, lizards, snakes, and penguins. Gilligan got the chance of a lifetime that summer to travel to Florida where she helped tag sharks and sting rays in the Gulf of Mexico. Within the first week working there, Gilligan was able to help remove barbs from sting rays which is something other students did not do until at least four weeks in. The education and training she received through her course and field work at Northland allowed her to be more prepared for the expectations and opportunities allowed through the internship. “It was a great experience and definitely my favorite thing of anything I’ve ever done,” said Gilligan. “I saw things I will never get to see again. I got to see a sting ray give birth on our boat and I got to hold baby sting rays.” During her time there, Gilligan handled and worked with Black Tip sharks, Nurse sharks, Southern sting rays and Butterfly rays. 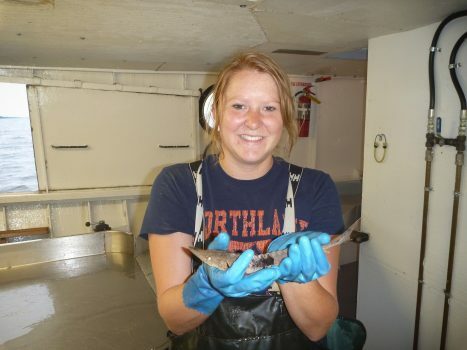 Before returning to school this fall for her senior year, Gilligan spent time working for the Bayfield Department of Natural Resources (DNR) to further develop her understanding of fisheries. Gilligan assisted with the summer assessment conducting surveys with the public about their experience with the fishery. Additionally, she helped net fish for population estimates and released brown trout into Lake Superior for the first time. Gilligan has also tagged a variety of other fish through her classes and work with the DNR. Outside of her academic work and field experiences, Gilligan has appreciated her ability to gain additional skills related to her desired future career through involvement in clubs such as electro-fishing and the American Fisheries Society (AFS)—a club in which she has served as an officer. Balancing academic coursework, several field work experiences, involvement in clubs and countless hours of team practices has been a challenge that Gilligan hasn’t shied away from. “When you have a lot going on, it helps you focus and get what you need done first,” Gilligan said. Gilligan also attributes her success in all areas of her college experience to many professors’ willingness to work with student-athletes as well as the emphasis that is placed on academic success by coaches at Northland. As a student-athlete at the College, Gilligan is part of a small, vibrant community that has shown strong support for athletics as the programs continue to grow and find success on and off the field of play. Gilligan has participated and contributed to a women’s golf team that showed dramatic improvement at the UMAC championships this fall. She has also been named to the All-UMAC Defensive Team for softball and played significant minutes for several past basketball seasons. Through athletics, Gilligan has developed leadership skills that have helped her take on additional roles on campus. She is an active member of the Northland Student-Athlete Advisory Committee (SAAC) and also participates in a new student-athlete leadership group that takes members of different Northland teams and brings them together to work on leadership techniques and work toward understanding different leadership qualities and styles. Gilligan’s collective experiences during her time near beautiful Lake Superior have prepared her to embark on her next journey—working to land a research position focused on fisheries management in graduate school. Her search for the right program could take her to a variety of places for the right position including Florida, California or Alaska. No matter where Gilligan ends up for her next journey, there is no doubt she’ll find immediate success thanks to the time and effort she’s put into every single endeavor she’s partaken in as a scholar and active member of the Northland community.